On June 15, 2017, Guyana tied the knot with ExxonMobil with the signing of a production license for the extraction of oil and natural gas, located offshore the Caribbean/South American nation with a population of 800,000 people. With this license, together with the Environmental Permit granted on June 1st, ExxonMobil will proceed with the Liza Phase 1 development. Located 120 miles offshore in an area known as the Stabroek Block, the Liza field development includes a subsea production system and a floating production, storage and offloading (FPSO) vessel designed to produce up to 120,000 barrels of oil per day. Exxon and its partners plan to begin production by 2020. ExxonMobil’s press release on June 16th states: “Phase 1 is expected to cost just over $4.4 billion, which includes a lease capitalization cost of approximately $1.2 billion for the FPSO facility, and will develop approximately 450 million barrels of oil. ExxonMobil is by no means alone in its pursuit of more profits. While its affiliate Esso Exploration & Production Guyana Ltd. (USA) holds 45% interest, its partners Hess Guyana Exploration Ltd. (USA) and CNOOC Nexen Petroleum Guyana Ltd. (Canada/China) hold 30% and 25% interest, respectively. Other players have also gotten on board. In January 2016, Guyana’s Minister of Natural Resources signed a petroleum prospecting license and production-sharing agreement with the joint-venture team of Tullow Guyana BV (UK) and Eco (Atlantic) Guyana Inc. (Canada?) with 60% and 40% interest, respectively. Commercial production is not expected to begin until another four years. That’s 2020. With continued record-breaking hot temperatures since 1880, Earth’s climate system already shows alarming changes. Rising sea levels, due to melting ice caps, is not good news for Guyana where the majority of the population lives along the low-lying coastal region. Will Guyana’s petrodollars come in time to relocate its capital and build a new port for the oil tankers? While Guyana plans for its oil-rich future, ExxonMobil continues to fund climate science denial. Although they knew decades ago that carbon dioxide emissions from the use of their products could result in dangerous climate change impacts, ExxonMobil chose to deceive their shareholders and oil-addicted consumers. The degree of deception demonstrates the industry’s lack of moral values. To endanger the lives of millions of people across our planet is a crime against humanity. Could it be that ExxonMobil and its facilitators have become victims of their own deception? 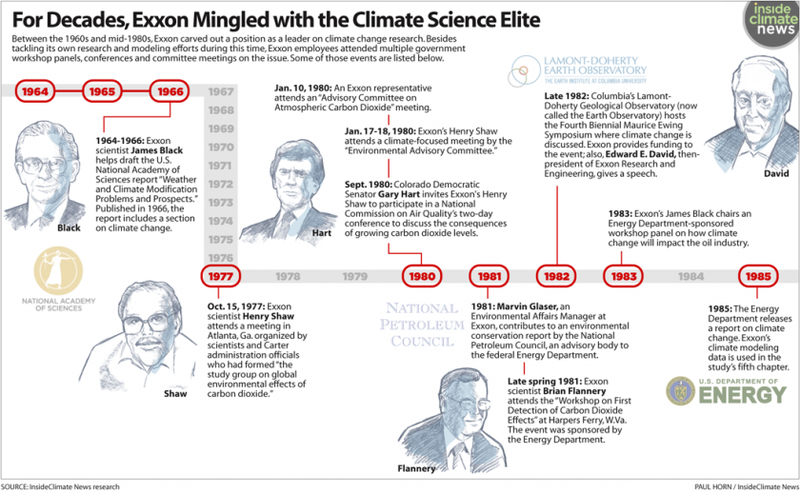 After eight months of investigation, InsideClimate News presents this multi-part history of Exxon’s engagement with the emerging science of climate change… It describes how Exxon conducted cutting-edge climate research decades ago and then, without revealing all that it had learned, worked at the forefront of climate denial, manufacturing doubt about the scientific consensus that its own scientists had confirmed. ~ EXXON: The Road Not Taken by Neela Banerjee, Lisa Song and David Hasemyer, InsideClimate News, September 21, 2015.